If we were to ask you if you are a Bible believing Christian the majority of you would say, “Yes, Absolutely!” And while that is an important question to answer, Cindy and I (Steve) believe there’s another question that’s just as important that we need to answer: Are you a BIBLE “LIVING” Christian? If your answer is yes, then can it be said of you that you are a Bible-LIVING spouse? It’s relatively easy to say that we believe the Bible. But it’s entirely different to say we actually “live out” the Bible in our daily lives—particularly as it pertains to how we interact within our marriages. Here’s a way to see where you stand in relation to this issue: If you consented to let your pastor place cameras in your home to record the things you said and did as a spouse to show the unedited tape to the congregation on Sunday morning, what would it reveal about you? Agreeing there is NO spouse that would relate in a “godly manner” 100% of the time (at least Cindy and I don’t), overall what would your video look like? Would it show that you seek God and His word to resolve conflict? Would the congregation see you as a person who honors your spouse, using the principles of Love and Respect (Ephesians 5) as the guide for your relationship? What about prayer? Is it more than just “lip service” to God? Is grace and forgiveness given when sins are committed against you? If you argue (and we all do), would your video show you doing it front of your children or in private? They wouldn’t see any screaming or physical violence, on your part, would they? …And the list goes on. But you get the picture. Here’s the important question… Is it obvious that God/Jesus is the anchor/foundation for your life, or would it be hard to tell? I’ll be honest, Cindy and I were guilty of some of those negative traits for many years in our marriage. But fortunately each of us came to the place of surrender and brokenness before God. We realized that to honor Him the best thing we could do is to have a marriage that reveals and reflects the heart of Christ. From that point on it has been hard work, studying (and applying) what the Bible says about relationship issues. this is particularly true, as it applies to marriage. Next, we’ve become students of one another to learn as much as we can. Admittedly, there have been times when we have crashed and burned along the way. But overall, there has been tremendous victory, and a DEEP love and respect that has grown between us. In fact, Marriage Missions grew out of our failures and our successes. And we are passionate about helping other couples navigate the difficult parts of marriage so they can enjoy more of the wonderful parts that God created for us to enjoy—together. There is an important point to all of this that we had better not overlook. We can attend every marriage seminar and Bible conference available. We can go on mission trips together, read our Bibles, and memorize scripture. But if we don’t PERSONALLY put into practice what we’ve learned we’re like the clanging cymbal in 1 Corinthians 13:1… empty. Jesus had stronger words. He would call us “whitewashed tombs” —just as He called the Pharisees. They looked good on the outside, but were rotten in places no one but God could see. That is not the way we want to be seen by God, our spouse, or anyone else! It’s also important for you to understand that you are not responsible for your spouse’s actions/responses. When you stand before God one day, the only focus will be on whether or not YOU were a Bible LIVING spouse. Excuses are not acceptable. Excellent thoughts to consider! My wife and I DO live out the Bible in many areas of life. We are deeply involved in ministry, and consistently strive to put into action the words of the Text. But it seems that our marriage relationship is where we struggle most in doing that. If we were to take your challenge and show unedited video of our marriage relationship to our church, we would probably receive a reasonably high review, even in our worst moments, and we would also surely receive a few suggestions of where we could improve. BUT… The real test is the thoughts in our minds and the desires of our hearts… and those aren’t so visible on video. As we grow in our walk with the Lord, we realize more and more how deeply we are stained with selfishness, as an example. We may outwardly “just do it”, choosing to do the Godly action for the other, but our heart isn’t always in it and we quietly grumble over it in our mind. And that can end up leaving places in each of us where the evil one can attack. Sometimes the spiritual battle can become much more intense than the physical battle. The Lord is continually working on us, and we are trying to always be open to His work. All Glory to Him! This was beautifully written M. Sometimes I feel as if my husband talks down to me alot. If I ask a question regarding anything I feel like he snaps at me. Leading me to guarantee my heart against him and watch what I say. I know if I’m sick I can’t talk to him because he mocks me. I learned that taking things to the Lord and writing helps. We pretend very well in front of company but in reality he has no respect towards me. I react and then I get in trouble with the Lord because I reacted. When I do respond my husband calls me rebellious. As a wife I worry at times and I thought I can talk to my spouse about things but I’m realizing more and more that I can’t do that. I guess this is what submission is, just not saying anything when my spouse yells at me. 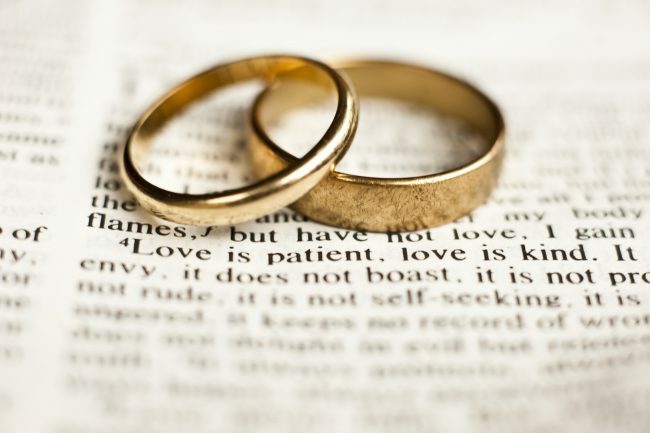 Luv, One of the most important lessons that God has been teaching me is this: The more that I can rely on Him and trust in Him and follow His plan for marriage, as written in His Word, the better our marriage will be. I have seen it play out time and time again that when I feel hurt and withdraw from the relationship, it causes my wife to also withdraw and puts a great distance between us. But when I feel hurt and am able to give it to the Lord and then forgive and step into the relationship, it causes my wife to come closer also and the original issue is easily resolved. And it seems to work this way for her also. Try to lay your burdens at the feet of Jesus, asking Him to comfort you and give you His strength. You might want to check out http://www.everybitterthingissweet.com. I have a sense that Sara Hagerty’s writing will speak to your soul in a special way. I will be praying for you, too. Thank you. I aprreciate the prayers. A part of me wants to walk out. But I know that’s not God’s will. Sometimes submission hurts and I always feel I’m doing something wrong. It’s very frustrating. I will check out the website. I will pray for you and your wife as well.